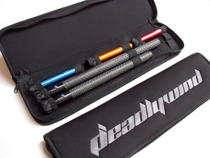 24" [+$35.00] 22" [+$20.00] 20" [+$10.00] 18" [+$5.00] 16" 15" 14" 12" 10" 8" 6"
The Deadlywind Null carbon fiber barrels are ultra-lightweight, accurate, and quiet. They are a straight-bore design with a 0.688" inside bore. Unlike other carbon fiber barrels, the Null barrel is built with a unique 3 layer construction. 2x2 satin Twill external, uni-direction fibers laid up in a strong multi-vector pattern, and then a super-slick "Silkfiber" inside that can be safely swabbed. Every component of the Null is 100% USA made, including our proprietary CNC-porting and assembly process. Every barrel is even hand-checked for QC-- You can't get any more accurate. This barrel is ready to use as-is. No inserts required!